Slice delicata squash lengthwise and scoop out seeds in the center. Cut squash into 1/2” slices and place on a baking sheet. Drizzle with olive oil and season with salt and pepper. Roast Squash for 20 minutes, turning once halfway through. While the squash is roasting, prepare vinaigrette by placing all ingredients into a mason jar with a lid and shaking to combine. Set aside. Remove the squash from the oven when the edges are golden brown and let rest until just warm, not piping hot. 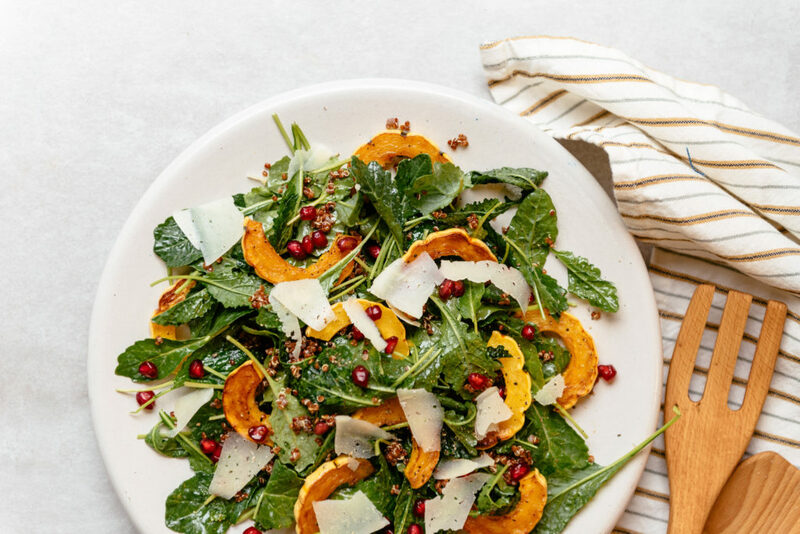 Combine kale, delicata, and quinoa in a large bowl and toss with the maple walnut vinaigrette. Arrange salad on a platter and garnish with pomegranate seeds and Manchego.